Tell your kids fun bedtime stories using these cute and cuddly Stuffed Animals! These Stuffed Animals will be your little one's friends. They will love to cuddle with them in bed and play and talk to them. and will make your kids fall asleep at night with their soft cuddly feeling! These are fun and cute stuffed animals that kids will surely have a lot of fun while playing. The big head makes them look much cuter. 6 Stuffed Animals With Big Heads per order. 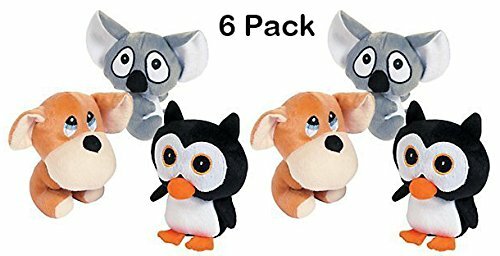 Includes: penguin, puppy and koala bear. Soft cuddling Animals brought to you by Kidsco. WHAT YOU GET - 6 Stuffed Animals With Big Head. Measurement 6". Comes in assorted colored animals, Includes: penguin, puppy and koala bear. For ages 5 and up. QUALITY MATERIALS - Made of high quality plush material. Soft and cuddly. 100% safe for kids. These stuffed dogs will be friends with your kids! These Stuffed Big Head Animals will be more than happy to be your lovely cuddling buddies. CUDDLING TOYS - These cute Stuffed Animals are perfect bedtime company for your little ones! These little Stuffed Animals With Big Heads are awesome to cuddle in bed. Kids will love playing with them and talk to them! CHECK US OUT - When it comes to purchase toys, you have plenty of options. However, a reputable company that cares about you and your project which will help you experience a better result. Kidsco has a large variety of toys, accessories and party supplies to meet your immediate needs and your needs in the future!